Nursing student scholarships give nursing students the chance to complete their degrees without taking on a large number of loans. While nurses receive a high salary, you never know how long it will take before you pass your boards or how long it might take to find a job. The longer you put off paying your loans, the more the interest builds up. Applying for one or more scholarships can help you pay for a portion of your education or for all two or four years you spend in college. 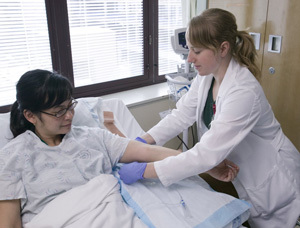 A large number of hospitals offer scholarships for nursing students. Hospital administrators realize that the students enrolled in those programs today are the same people who may one day work for them. These programs typically award scholarships to those with good grades and those who show they are deserving. Some scholarship programs give money to students from underprivileged backgrounds, and most programs award scholarships to students who live within the same zip code as the hospital. You may even find some programs that give you money for books and other costs beyond your tuition. You probably already know that the government offers loans and grants for students, but did you know that you can also get nursing student scholarships from the government? The U.S. Department of Health and Human Services Health Resources and Services Administration offers several scholarships for students enrolled in nursing programs. You receive money for your tuition, uniforms, books and other fees, but you also receive a monthly stipend that lets you focus on your education without worrying about working a full-time or part-time job while in school. Eligible students agree to work in an underprivileged area for a minimum of two years after finishing school and passing their boards. College scholarships are another option for nursing students. Many colleges offer a number of smaller scholarships and programs that will help you pay your tuition costs. If your school doesn’t offer nursing scholarships, consider enlisting in a work-study program. You can work for the school and use the money to pay for fees, tuition, books or room and board. Work-study programs typically pay more than minimum wage, and you might find work as a housekeeper or call center operator. Some schools will even let you work in the healthcare center on campus. Did you know that you can get a scholarship if you’re left handed, a female golf player or have Native American ancestry. There are hundreds of college scholarships available that go unclaimed every year because the organizations do not receive any applications. Some organizations give students money for having red hair, being taller than a certain height or for being a member of a certain club. You can use those unusual scholarships with the nursing student scholarships to pay for all the costs you face. Many students attend college without paying a single dime out of pocket because of the scholarships they receive. Scholarships are available for people of all ages, backgrounds and majors. As a nursing student, you can look for programs through local hospitals, organizations and even through your own college. Nursing student scholarships can help you cover the cost of tuition, pay for room and board and even pay for the uniforms you need during your clinical experiences.